Stacy Tilton Reviews: The Ultimate Mother’s Day Escape - at home! The Ultimate Mother’s Day Escape - at home! As a mom we all have our days where we wish we could just "escape" it all and get away. But also as moms we know everyone is counting on us and leaving for any period of time probably means we will be coming back to an even bigger mess. So we have to do our best and find ways to relax at home. I like to do this behind a closed (and locked) bathroom door in my jet tub. Maybe a little relaxing music or audio book playing in the background and a tub filled with nice hot water and some aromatherapy products to help me relax. Sometimes I like to use bath melts or other products that dissolve in my bath tub so I can enjoy the fragrance while I relax. But there are also times I want to relax, but only have time for a shower. That's when essential oils come in real handy. I can set up my diffuser in the bathroom to give me that same relaxing fragrance while I shower, and it's still there when I get out and finish getting ready. The products in both of the lines showing in my photo are perfect for enjoying at home when you need a little down time. So why not give mom the best gift this upcoming Mother's Day - The Ultimate Mother’s Day Escape - at home! New Double Butter Bath Melts, Botanical Bath Teas, and Essential Oil Blends come in two collections: Purify, a new collection featuring Tea Tree and Sweet Orange to detoxify and protect and Calm, the existing Aromatherapy collection, infused with Lavender and Chamomile to relax and unwind. • The Purify and Calm Double Butter Bath Melts provide spa indulgence at its finest. Unlike traditional bath bombs, they slowly dissolve around you while nourishing Shea and Cocoa Butter moisturize your skin leaving it soft and smooth. • Use the Purify and Calm Botanical Bath Teas to create a relaxing herbal bath or a cleansing facial steam. Each tea bag combines popular aromatherapy ingredients including essential oils, flowers, extracts and salts. 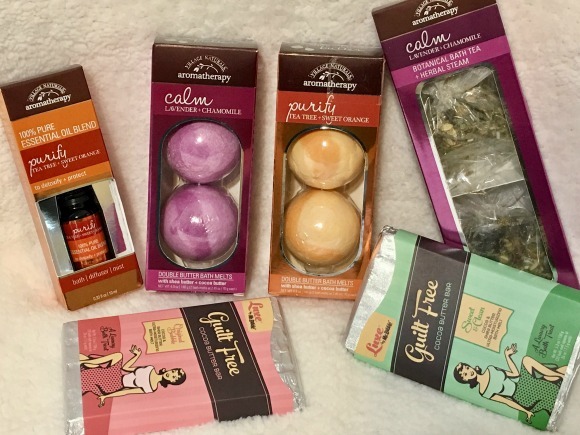 • Purify and Calm Essential Oil Blends are comprised of 100 percent pure essential oils to indulge your senses and enhance your mood. Add to your bath, a room diffuser or unscented lotion to help balance the mind, body and spirit. The Luxe Guilt Free Cocoa Butter Bar is an ultra-moisturizing bath melt uniquely shaped like a candy bar that breaks into perforated squares – enough for five luxurious baths. Enriched with nourishing Cocoa and Shea Butter, the decadent bath treat slowly melts around you, leaving your mind relaxed and your skin irresistibly soft.